More than 300 people have been killed in the rural eastern Ghouta district on the outskirts of Damascus since Sunday night, and many hundreds have been wounded. 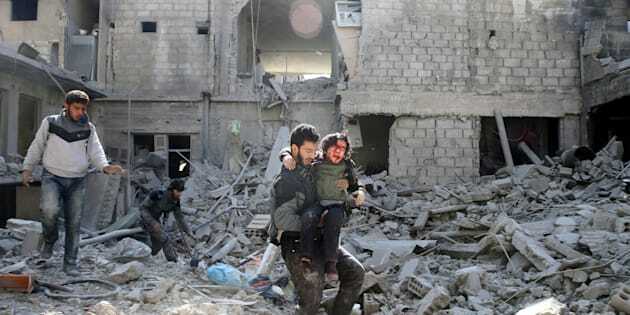 A man carries an injured boy as he walks on rubble of damaged buildings in the rebel held besieged town of Hamouriyeh, eastern Ghouta, near Damascus, Syria, February 21, 2018. AMMAN, Feb 22 (Reuters) - Warplanes pounded the last rebel enclave near the Syrian capital for a fifth straight day on Thursday, as the United Nations pleaded for a truce to halt one of the fiercest air assaults of the seven-year civil and prevent a "massacre." In the north, where Turkey launched an offensive in the past month against a Kurdish militia, the Kurds said pro-government fighters were now deploying to the front lines to help repel the Turkish advance. Government forces also entered a part of Aleppo controlled by the Kurdish YPG militia, a witness and a monitor group said, although the YPG denied this. The Kurdish YPG ― allies with the United States in other parts of Syria ― have sought assistance in recent days from the Russian-backed government to resist the Turkish offensive, an example of the unexpected alliances wrought during a multi-sided conflict that has drawn in neighbors and world powers. International attention is now focused on the humanitarian plight in the eastern Ghouta, where 400,000 people have been under siege for years and where government bombardment escalated sharply on Sunday, causing mass civilian casualties. "There is a need for avoiding the massacre because we will be judged by history," U.N. Syria envoy Staffan de Mistura said. De Mistura said he hoped the Security Council would agree to a resolution calling for a ceasefire in eastern Ghouta, but acknowledged it would be difficult: "I hope it will. But it's uphill. But I hope it will. It is very urgent," he told Reuters as he arrived at the United Nations in Geneva. President Bashar al-Assad's veto-wielding ally Russia says a ceasefire would be hard to achieve. Moscow and Damascus say their assault on eastern Ghouta is necessary to defeat fighters who have been firing mortars on the government-held capital. "Those who support the terrorists are responsible" for the situation in eastern Ghouta, Kremlin spokesman Dmitry Peskov told a conference call with reporters. "Neither Russia, nor Syria, nor Iran are in that category of states, as they are waging an absolute war against terrorists in Syria." Aid workers and residents say Syrian army helicopters have been dropping "barrel bombs" - oil drums packed with explosives and shrapnel - on marketplaces and medical centers. Residents and insurgents in eastern Ghouta say high-altitude jets of the kind involved in bombing on Thursday morning are Russian, as Moscow's warplanes typically fly higher than those of the Syrian air force. Residents and opposition figures say the Syrian government and its allies are deliberately harming civilians in a "scorched earth policy" to force rebels to surrender. "They want to break our will and turn Ghouta into another Aleppo but this is their dream," said Yusef Dughmi, a resident in the devastated eastern Ghouta town of Arbin overnight. "Why is the regime targeting us we are civilians and the regime and Russia are only targeting civilians?" Khaled Shadid, a resident of Douma told Reuters by telephone as sounds of explosions could be heard. Basema Abdullah, a widow who was huddled in a basement with her four children in Douma said: "We are in desperate need for your prayers," before the connection was cut off. One of the main rebel groups in eastern Ghouta said Moscow, which had agreed to a "de-escalation zone" in the enclave, would accept only accepting a rebel capitulation. "The Russian concept is complete surrender to the Assad regime's authoritarian and security grip and they need no excuse to storm the Ghouta," said Wael Alwan, spokesman for the Failaq al Rahman group. Rescue workers said at least 40 people were killed during Wednesday's heavy bombing of Kafr Batna, Saqba, Zamalka and Arbin and other towns in the opposition enclave. In the town of Haza, the bombing targeted a field hospital and a bakery, rescuers said.